New World Flamengo Jazz is a music category some may not be familiar with, so if you can imagine a sunny tropical atmosphere with an oceanfront setting and gentle tides splashing against the shoreline you begin get the picture. When you combine this imagery with exotic melodies and glowing rhythms you are set for a beautiful day of fun in the sun. Tomas Michaud from Alameda California has accurately termed the phrase New World Flamenco Jazz and this precise terminology tells a lot, but more importantly it is about the sensations you feel and the affirmative imagery acquired from his world blend of contemporary instrumentals and Latin acoustic guitar designs in new World Fusion music. These elements are also the fine attributes that create a new category of music from his various contemporaries like Ottmar Liebert, Govi, or Johannes Linstead. Tomas Michaud defines his unique singular style in World Fusion having the fundamentals of Nouveau Flamenco, New Age and Smooth Jazz, but with Latin and South American rhythms that embrace Middle Eastern and Spanish music, along with Caribbean and Mediterranean harmonies. This may sound way too complex, and I am sure it is for the guitarist, but for any music aficionado it translates into charismatic melodies that turn an empty white canvass into a masterful portrait complete with colorful designs that are pleasing to the heart and mind of a broad audience. Drawing his harmonious inspiration from Central and South American travels, the lengthy list of beautiful travel destinations recited on this album include Spain, Portugal, Mexico, Colombia, Peru, France, Costa Rica, Guatemala, and Singapore. Knowing his lengthy list of travel destinations across many continents and categorical guitar inspirations, then New World Flamenco Jazz is definitely an accurate description. 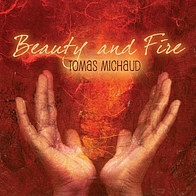 Beauty and Fire has 12 original compositions by Tomas Michaud and it quickly becomes clear his precision Flamenco styled performance on nylon – string guitar is a leading component of professional beauty, but the numerous distinguished musicians in accompaniment is another attractive element that makes this album flourish. Beauty and Fire ( Title Song ) is an adventurous retreat into paradise by a peaceful East meets West cultural blend and this first song truly does make a meticulous statement about his singular New World Flamenco style with marvelous certainty. Two Hearts Into One & Night Into Day are pleasingly balanced by their relaxing melodies, along with another elaborate reflection carried into the moderate timed but equally rhythmic Embrace In The Mist & Morning Grace. 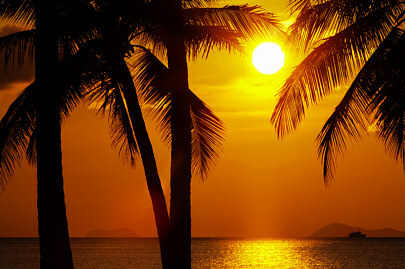 Deep melodic strides and tantalizing refrains are heard in Tango In Paradise while Gipsy Heart is quite breezy by the casual atmosphere an of accentuated guitar strides shared with violin. Living On The Wind retains a wonderful fascination by the amicable melody that can also be identified by an air of lively sophistication set in motion by magnificent guitar and piano rhythms backed by light instrumentals with plenty of quality percussion accents. Thomas Michaud has a singular music style is a point I wanted to make today, so when selecting your album purchase at music outlets and you don’t find a New World Flamenco Jazz category try searching under New Age, World, Flamenco, Jazz, or Contemporary Instrumental sections. That is until the day retail outlets introduce a fun in the sun music category. The musicians joining Tomas Michaud on Beauty and Fire are Don Turney on Grand Piano and keyboards, David Margen on Bass and Kai Eckhardt on Fretless Bass. Strings include Lila Sklar on violin and Michael Knapp on cello with Aharon Wheels Bolsta on Tabla and Thomas Perry, Celso Alberti, and Brian Rice on percussion. Visit the worldmelodies.com website to sample / purchase or visit his CDBaby.com page and Amazon.com page. Album art courtesy Elena Ray. Big Stock Photo copyright ersler.